There's nothing more worrying than getting an email saying there's been a change in your UCAS application... Luckily, this was a good change. 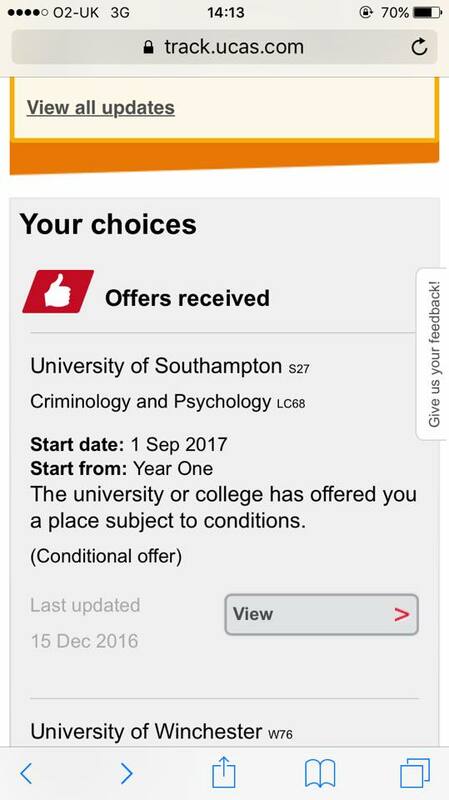 Today, I received a conditional offer from the University of Southampton to study Criminology and Psychology which I am very happy about as it is one of my top choices. It also means that I have received 2/5 offers in less than two weeks which for me, is an accomplishment. I feel especially happy about this offer because it is from a Russell Group university and I was advised not to apply to these due to the fact that "I won't get in". However, I decided to go against these comments because let's be honest, I don't let people tell me what to do. I am so looking forward to seeing certain people's faces when they see that I've proved them wrong. Another really great thing about this is that the usual offer given is AAB for my course which I was predicted but it would have been A LOT of pressure. Although, the offer they have given me is BBB which I think is definitely a feasible goal and something that, despite having to work hard, I will be able to achieve in the long run. Overall, I'm happy with this especially considering I really liked the university when I visited in July and this makes me feel a lot less nervous about the whole application. Do you have any changes in your future plans?